I guess feebay had too many "defects". Trading shares of eBay for shares of Paypal on a one to one basis is a no-brainer. Paypal has its problems, but eBay is a complete mess. Personally I would be surprised if June 2016 rolls around and eBay is not under new ownership or, under the same ownership but with a near complete overhaul of all senior management. Ebay just cannot limp along much longer under current management and corporate policies. For more than a year I have thought the whole site looked to be stumbling towards outright collapse. I am surprised it has held together as well as it has this long. Keeping in mind that ''as well as it has'' means no more than that eBay has consistently under performed but avoided outright collapse. Things are really bad at eBay. I am surprised the market has not picked up on just how bad the situation has been over the last 19 months. The window of opportunity to preserve the marketplace at anywhere near its current market share has probably already passed. Of course it does. Ebay Marketplaces lagging performance has always been papered over by Paypal's good performance. That was part of the charade by JD and the former CFO. Truth is Ebay offers very little growth potential and return for investors. Like a rat deserting a sinking ship! Everyone said JD's was a moron. I know I did, until he managed to exit eBay with $23 million - some of that mine (and everyone elses) that he helped steal with his "thinking days". I guess they werent thinking days thinking about eBay, they were thinking about how to exit eBay and not go to prison for extortion and racketeering. ALL of us know that eBay is heading towards "that great 11main in the sky" since there isnt a one of them in San Jose that knows how to run an ecommerce site. Wenig is trying - not for our good, but for his own. He's DESPERATE for his own $23 million, but wont get it at the rate the eBay of today is going. Hes made a few changes, but listening to numskulls like Uncle good Greif, and Jordan Sweetbutt isnt going to be enough. They have no practical experience so its like asking your dog where he buried your slippers - you wont get an answer you'll be satisfied with. This Xmas will be the make or break for eBay. Its either "go big or go home", and if eBay us BEGGING for sellers, and trying to be "flexible on returns and shipping metrics", then (since it goes back on what eBay claimed was "so important") they must be in DEEP trouble. eBays goal has always been to manage every part of the transaction, all while claiming it wasnt involved at all. Giving sellers control must be KILLING them! Between Amazon and now Walmart (whos been picking up ALOT of the major small to midsized private sellers) they must be making eBay VERY nervous. Im sure the eBay investors want SOMEONES head on a pike - question is who will it be? Icahn knew - and bailed. Im just going to sit back and watch the fireworks! Ichan's dumping of eBay shares indicates that he believes there is little or no profit potential going forward as a corporate investor. Personally, I believe that from day one, Mr Ichan viewed eBay as a failing antiquity but envisioned PayPal as a company that could make him some money. That is the reason Ichan insisted the two companies be separated. IF eBay is going to survive the company needs to be taken private and escape the expectations of Wall Street. The pressure of being a publicly traded company have been the root cause of eBay's demise. The policies that have been put into place which have destroyed the marketplace were designed solely to impress investors in the hopes of driving up the value of eBay shares. The bottom line result of the Wall Street pressures is that the marketplace is imploding due primarily to fact that what made the marketplace a booming success in it's early days has been lost to the need to genuflect to Wall Street analysts and drive investor value. Wall Street analysts never appreciated, understood or cared about what made eBay the early success it was. The distractions associated with meeting Wall Street expectations translated into decisions and actions which have all but killed the once successful marketplace concept. eBay needs to escape the distractions of meeting Wall Street expectations & driving investor profits. To survive, eBay needs to resume being laser focused on what it takes to restore the marketplace back to being a profit center for the platforms sellers. If sellers can not be profitable in the eBay marketplace, they will flee just as Mr Ichan has. CARL : here's a Tip : dump PayPal. Good Timing on Carl's move. My credit card info was breached on Ebay a few days ago. Never thought Icahn had much in the way of common sense. Still don't. But I love the way he is becoming a bad nightmare to the donut hole. Like JD, Carl is in it for Carl. JD must be thrilled. Another monkey on his back. Good. JD could use a monkey on his back. eBay sellers need to dump eBay and head over to ecrater. He was ALWAYS "in" eBay for Pay Pal. The truly sad part is that when it all comes crashing down, no one will be held accountable....they will just drift off to other jobs with their millions. The real victims will be all the sellers that put up with all of this BS and somehow ''survived'' (and I use that word with hesitation). We will be the ones that suffer as they will have ruined a once great place to sell and make some $$$. Do you think any of them will think twice or lose one minute of sleep? Not a chance....that is the truly sad part....no one will suffer as we have. 1/1/2016 we sellers will have new owners of ebay to deal with. Carl must not have much faith in them to move his money or he already has invested in their parent company who will buy ebay. Feels great to know we will soon be rid of these Pirates. First Icahn move: Split the two companies up. Second move: Dump eBay stock and place chips to PayPal side. Next move: Place pressure on the Hoe to leave before he takes BOTH COMPANIES into the toilet. AND NO ''GOLDEN PARACHUTE'' THIS TIME FOR JOHNNY!! I have been thinking about this whole ''life after eBay'' situation for about a year now. If (When) eBay collapses a lot of its former traffic will gravitate to other platforms. I think Bonanza and Etsy will grow at increasingly rapid rates over the next year or so. I expect Alibaba plans to buy a prostrate eBay now rather than open up a new US based marketplace. Amazon will be the big winner, but that is a given. Bottom line, buyers will still spend money on-line, more and more so moving forward. And if they are not spending it at eBay they will spend it elsewhere. Ebay's on-going collapse will continue to create problems for sellers like myself. There just is no other marketplace that is positioned to replace eBay yet, and I doubt there will be one in place by the time the big collapse hits. If there were one really growing at this time that would probably expedite the collapse of eBay quite a bit. I suspect I am like the vast majority of sellers at eBay. I absolutely hate the site but am there because at this time there just is no comparable alternative. Let me say as an eBay seller I would dump Paypal over eBay. I make my money on eBay, Paypal can be replaced with many different payment options. But replacing eBay isn't as easy if you want to have sales! A) eBay promised them %80 of their current business - can Paypal exist on its own WITHOUT that %80? B) Since eBay is still "too cozy" with Paypal (a supposed separate company, though its still eBays enforcer) when will the time come that someone will force them to REALLY separate? eBay (still) has PLENTY of cash. They have $5 billion sitting off shore (used to be 9 but JD spent alot of it on nothing), so I wouldnt be so quick to "wave them goodbye". They can go for a LONG TIME with that money plus what ever normal business + the holiday brings them. I would think that a new owner (company) would take them over .... my bet Rakuten/buy.com (but who knows if they have that kinda cash). Paypal? They have changed the rules enough (under JD) to survive using the eBay method of business. That method forces sellers to take all losses, interfere in every part of a sellers business plan, then walk away claiming they are responsible for nothing. But if Apple wont get back on board and use them (they would be on crack if they actually did but still could) ... where will their growth come from? It wont come from eBay, thats for sure. While Paypal does have a better reputation then eBay - its not by much. I was at a toy convention on Suday - the words eBay and Paypal elicited laughs and snorts. %99 of the toy dealers (who sell vintage toys as a business) said they wouldnt put their items on eBay, wouldnt sell on eBay at all (non business items) and would never use Paypal - cash only. They dont want someone controlling their funds. eBays real problem is WALMART. Walmart has DEEP "Sams Club pockets" and is out to unseat Amazon - eBay is just the dummy in the way to that goal. How do I know? Conference call with them while applying to be a 3P seller there. DW better put HIS "thinking days" to good use if he wants to avoid being run over by the "brothers of destruction" aka Amazon and Walmart. Thats why (in my opinion) DW said "Long tail" items and not commodity items that the other 2 have. He didnt say it to be altruistic or because he REALLY loves smaller sellers. He needs them and their unique items to stay relevant. 2016 should be an interesting year! The End, not dead for us. Doing quite well there with zero stress. 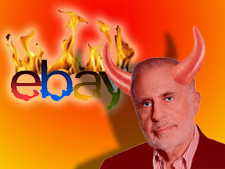 As I recall, Icahn's claim was that PayPal was being held down by ebay, not the other way around. So it's no surprise that he would want to own PayPal shares rather than ebay.